This Shabbat we celebrate a very special moment in the Torah, a very musical moment in Jewish biblical history. This Shabbat is Shabbat Shirah. It is the Sabbath of Singing. Many congregations highlight this Shabbat by creating services brimming with extraordinary music to celebrate Moses and Miriam leading the Israelites across the Sea of Reeds (The Red Sea) and out of Egypt. This Shabbat we read Parashat B'shalach from Chapter 15 in the book of Exodus. This section is important for several reasons. It is visually, liturgically and musically important. 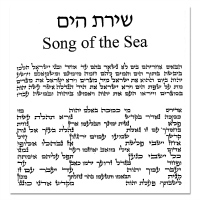 Shabbat Shirah gets its name from part of the sedra (weekly Torah reading) known as Shirat HaYam (song of the sea). Visually, this song/poem is laid out very differently from the rest of the Torah so it is very obvious to the reader and to the congregation during Hagbah (the lifting of the Torah after it is read) that something special is happening. It is known as 'brick on brick.' There are several additional songs/poems in the Torah that are also written differently than the rest; another great example is Parashat Haazinu in Deuteronomy Chapter 32, which is written in two narrow columns. Liturgically, this is the part of the Torah from which the Rabbis selected Mi Chamocha to become part of our worship. The prayer is taken from Exodus Chapter 15, verses 11 and 18. "Mi chamocha ba-ei-lim Adonai, mi ka-mocha ne-e-dar ba-kodesh, no-rah t'hi-lot o-seh feleh (11). Adonai yim-loch l'o-lam va-ed (18)." "Who is like You, O God, among the gods that are worshipped? Who is like You, O God, majestic in holiness, awesome in splendor, working wonders (11)? Adonai will reign forever and ever (18)!" There are so many wonderful settings of Mi Chamocha. Here is one of my favorites that includes English, composed by Rick Recht. Musically, not only does Shabbat Shirah lend itself to be a service throughout which one is totally immersed in amazing music led by the Cantor, choir, temple band and guest musicians, there is a special musical motif that exists just for this song/poem in the Torah. When we read Shirat HaYam, we intertwine this special melody with the regular Shabbat Torah chant. Listen as I chant Mi Chamocha as it appears in the book of Exodus. By hearing this melody and seeing the way the verses are written, it is impressed upon us that something special is happening, so we should pay attention! A similar excerpt of the Shirah chant was included in the movie The Prince of Egypt in the song "When You Believe." The segment of chant begins at 2:28. Many congregations will also be holding musical concerts and other events to celebrate Shabbat Shirah. You may recognize another part of Shirat HaYam from Debbie Friedman's z"l " Miriam's Song," from Exodus Chapter 15, verses 20-21: "Miriam the prophetess ... took the tambourine in her hand; and all the women followed her with tambourines and dances. And Miriam called to them: "Sing to God..." (JPS translation). If you are wondering why we would be addressing the story of the Exodus from Egypt at this time of year, and not merely around Passover, my answer to you would be this: We celebrate Passover in the spring partly because of its connection to the harvest season and the timing assigned for the Feast of Unleavened Bread given by the Torah. Yet the Torah reading cycle brings us the story of the Exodus during this time of year. Not only do we read the story, we have a special Shabbat dedicated to celebrate the crossing of the Red Sea – Shabbat Shirah. As a Cantor, I can think of no other holiday that is inherently dedicated to singing and not just any kind of singing – Jewish women singing. What better way to share in the celebration of the Exodus from ancient Egypt than with song – just as Miriam enjoined the Israelite women in song and dance. Source: Miriam's Song by Debbie Friedman from Songs of the Spirit, Disk 1, track 19. Cantor Marnie Camhi serves as the Cantor of Temple Beth Miriam in Elberon, NJ on the Jersey Shore. She was ordained from the Debbie Friedman School of Sacred Music of Hebrew Union College-Jewish Institute of Religion in 2006.